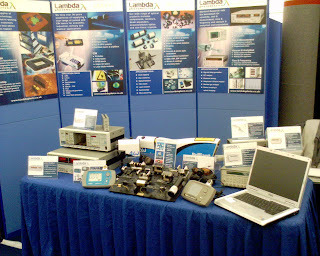 We recently attended an exhibition at RAL which went very well. We would like to thank the staff at Rutherford who attended the exhibition and made it a success. On our stand we displayed some SRS test & measurement equipment, a range of PI nano and micro positioning systems and some of our laser products. Below is a small picture taken Adrian Piddington (on his camera phone) of our stand.